As the British summertime heats up, we look to be set for a fair few heatwaves. Whilst this is great news when it comes to breaking out the BBQ and catching some rays, it’s a potentially deadly time for our four legged friends. The dangers of overheating are no secret for dog owners and should be treated as serious business. 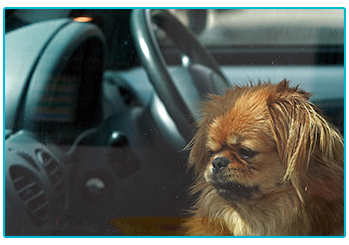 Leaving your pooch in the car, with little ventilation or escape from the heat, can be one of the most irresponsible things for any owner to do! At The Insurance Emporium, we know how vitally important it is to look out for your dog in this weather! That’s why we put together this guide on the dangers of leaving your dog in a hot car! Imagine driving along in your car on a sunny day without the air conditioning on or a window open, you’d probably be feeling rather uncomfortable very quickly! According to the RSPCA, when the temperature is 22 degrees outside, the interior of your car can heat up to a truly sweltering 47 degrees within an hour! Very few living things could last long in this heat. Being left in these extreme temperatures could very quickly lead to heatstroke in your pooch. There are numerous symptoms that might give you a good indication that a dog is suffering from heatstroke. Restlessness, excessive thirst, heavy panting and vomiting are some of the tell-tale signs. It’s vital to try and combat these symptoms as quickly as possible. Give them water to drink as soon as you can and try to immerse them into cold water in order to bring their body temperature down. A full list of symptoms can be found on the PETA website. If you see a dog left in a hot car, the first thing to do is to establish the animal’s condition. If you can’t see any signs of heatstroke then take down the registration number of the car and try to find the owner. Always be prepared to pick up the phone and call for help if you think that heatstroke is coming on. The RSPCA have no powers of entry, so if you think there is cause for concern you’ll need to dial 999 as soon as possible! Don’t worry, this is a perfectly acceptable reason to call the police and you won’t get in any trouble! If you’re waiting for the police and the situation looks urgent, you may feel compelled to break into the car. You should be very careful about this, as it could be classed as criminal damage! If you think this is definitely necessary then tell the police why you’re doing it, get the names and numbers of witnesses and try to take some pictures. This should always be a last resort in order to save an animal’s life! When is it ok to leave a dog alone? Quite simply, it’s never a good idea to leave your dog alone in a car, never mind on a hot day. 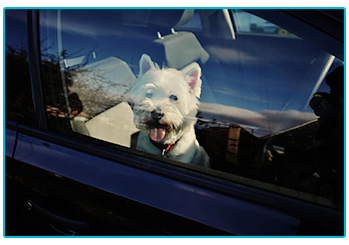 Many people think that leaving the window open slightly, providing water or parking in the shade will stop their canine overheating in the car, however this isn’t necessarily the case. Water might help prevent dehydration but heatstroke is a different matter. Also, dogs cool themselves by panting, the small amount of ventilation from a slightly opened window won’t be enough! 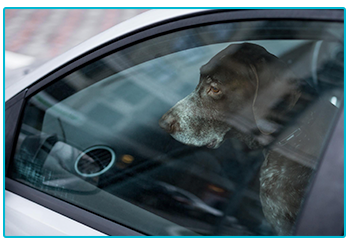 It could be tempting to leave your dog in the car even if it’s “just for five minutes”, the risks posed can be devastatingly deadly and we’d recommend that you don’t take any chances! Keeping your pet pooch happy and healthy during the summer could help prepare you for many an adventure, that’s why you might want to think about purchasing some Pet Insurance for your dog. At The Insurance Emporium, our new Dog Insurance policies include a 20% Introductory Discount* and cover up to £8,000 Vet’s Fees^. Head to The Insurance Emporium today for a quote! ^£8,000 Vet’s Fees available on Lunar Monthly Lifetime Gold policies. This blog is in no way sponsored, endorsed or administered by, or associated with PETA or the RSPCA.